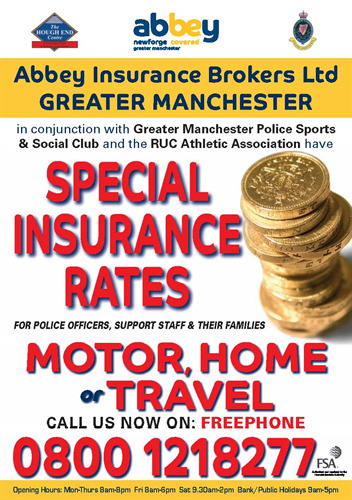 Seven years ago the RUC Athletics Association launched an insurance scheme for the benefit of the Police and Staff in Northern Ireland. The office is in the RUC Athletics Association Club at Newforge Lane, Belfast. Greater Manchester Police Sports Club is already on the scheme joining other UK forces such as West Midlands, South Yorkshire, Essex, Lancashire, Cambridgeshire, Kent and Strathclyde. All serving and retired Police officers as well as Police Staff. The scheme is also open to all family members such as grandparents, parents, spouse or partner, brothers and sisters as well as children. The scheme offers cover for private vehicles as well as home and travel insurance. We do not cover Male drivers under 20 and Female drivers less than 18 years of age. How secure are your details. The scheme is based in the Police Club premises in Belfast. The complex has 24 hour security. Your details are held on a secure database and all employees are security vetted. We do not share your details with anyone else so you will not receive a sack full of junk mail and unsolicited offers from anyone else. All you receive is a very competitive quote for insurance. How do I contact Abbey GMP? We have a Freephone number: Tel: 0800-1218277. It is very simple. You get excellent quality insurance cover and will be pleased at the savings to you and your family. Your Force Sports & Social Club also receives a percentage return from the scheme to help improve your member benefits so everyone is a winner.